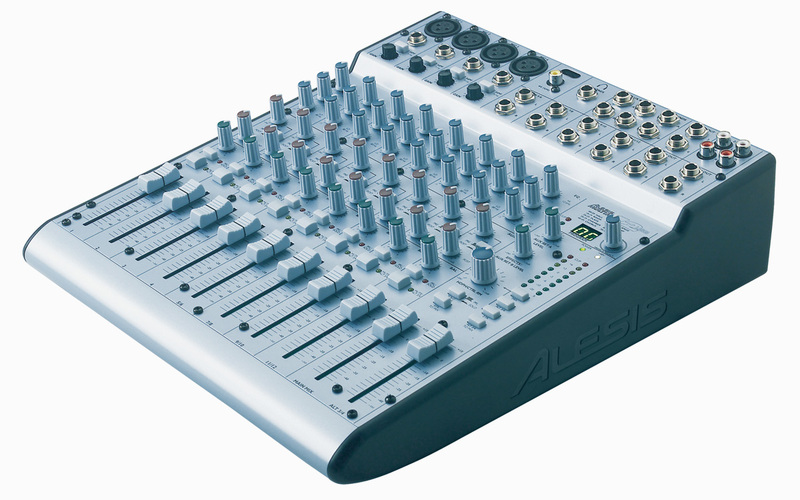 The Alesis MultiMix 12 USB mixer features USB connectivity, low-noise analog electronics, 100 studio-grade 28-bit digital effects, and rock-solid construction. Whether used for mobile or studio recording, the MultiMix 12 USB mixer gets the job done right. CONTROL Front-panel channels (top down): 4 mic/line channels with 75Hz highpass filter switch and mic/line gain. All channels with 3-band EQ (high shelving at 12kHz, mid bandpass/reject at 2.5kHz, low shelving at 80Hz), aux send A (pre- or post-fader), aux send B (post-fader, onboard or external effects), pan or balance, pre-fader listen or solo-in-place, mute or alt 3/4, 60mm fader. Front-panel other: Effect section with selector plus clip and signal LEDs. Aux return A level, effects/aux return B level. Headphone/control room out level with mix, alt 3/4, 2-track, and alt 3/4 to mix switches. Solo mode, 2-track to mix switches. Stereo main and alt 3/4 60mm faders. Stereo 8-segment LED meters. CONNECTIONS USB 1.1 Stereo input/Output for PC and Mac. All 1/4" TRS except as noted: Mic in x 4 (XLR), mono line in x 4, stereo line in x 4, aux sends x 2, stereo aux returns x 2, stereo main out, stereo control room out, stereo alt 3/4 out, headphone out. 2-track stereo in and out (RCA). WEIGHT & DIMENSIONS 3.75" x 11.25" x 13.25" (H x W x D) 7lbs.